June is Pelvic Organ Prolapse Awareness Month and I’ve written several blogs this month about the issues mothers face postpartum. I talked about what is normal after birth here and here. And about the secrets of motherhood nobody tells your about here, where I describe what prolapse is and the symptoms of prolapse. It’s Prolapse Awareness Month and I want to bring awareness to this (often distressing) issue on a global scale. I am deeply passionate about helping women return to the exercise they love despite prolapse, whether it’s walking, swimming, running, gym, bootcamp, Pilates, yoga or crossfit. For this reason i’m hosting a free live online training, which will be all about prolapse and the exercises you need to do to overcome it. I wrote about the importance of the core canister muscles here; once you’ve mastered them, it’s time to integrate the core muscles with movement. The following exercises will get all your pelvic support muscles working optimally. This exercise works your core canister and your inner thigh muscles to provide a strong support from underneath and anteriorly for your prolapse. Lay in your aligned lying position. Line the middle of your feet, your knees with your front hip bones. Check your front hip bones pointing straight up. 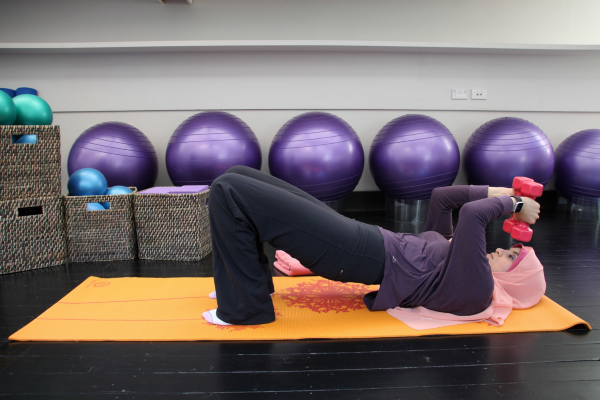 Flatten your upper ribs onto the mat but keep a curve in your lower back away from the mat. As you breathe out, squeeze and lift your pelvic floor muscles and tighten your lower abdominal muscles in towards your spine, as you squeeze your knees together around the ball. As you breathe in, relax your pelvic floor and lower abdominal muscles as you let the knees relax. 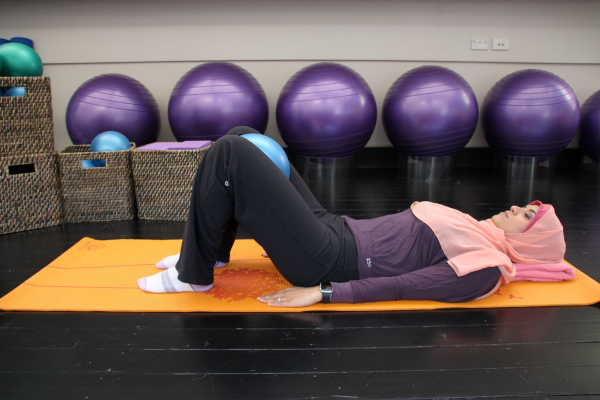 This exercise works your core canister and your hip and buttock muscles to provide a strong support from underneath and from behind for your prolapse. Have your front hip bones pointing straight up. Bring your feet closer to your bottom. As you breathe out, squeeze and lift your pelvic floor muscles and tighten your lower abdominal muscles in towards your spine, as you lift your hips up into a bridge position. 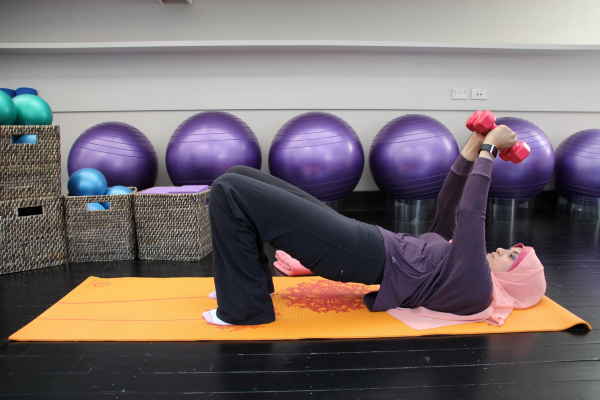 Hold here in bridge as you breathe in, relaxing your pelvic floor and lower tummy. As you breathe out, lower your hips to the ground while you squeeze and lift your pelvic floor and tighten your lower abdominal muscles to your spine. This exercise works your core canister and your hip and buttock muscles combined with your posterior shoulder and back muscles to provide a strong support from underneath and posteriorly for your prolapse. Find your pelvic bridge position. Holding on to your weights bring your arms up to shoulder height. Keep shoulder blades spread across your upper back and firm on the ground and down away from your ears. Breathe in as you slowly lower the weights down toward your forehead bending at the elbows only and keeping the elbows at shoulder height. As you breathe out, squeeze and lift your pelvic floor and tighten your lower abdominal muscles towards your spine, as you simultaneously straighten your elbows bringing the weights back to shoulder height. Breathe in as you relax your pelvic floor muscles and simultaneously bend the elbows lowering the weight towards your forehead. You can keep your lower abdominal muscles engaged here to allow for a deeper breath into your diaphragm. Breathe out as you re-lift the pelvic floor, keep the lower abdominal muscles tightened and press the weights back up, straightening the elbows. Repeat 8–10 tricep presses keeping the core canister engaged. Want to know more about the exercises you need to be doing to recover from prolapse so that you can return to the exercise that you love?